In a profound book author John Adam presents a discussion of covenants through fifteen short stories that will provoke thought. Witness God’s plan for planet Earth unfold as determined from scriptures quoted from the New International Bible and the latest scientific evidence. The scientific evidence discussed was gleaned from the further reading references. These books discuss scientific studies produced by evidence obtained using telescopes, microscopes, and powerful computers while scientists unraveled the human genetic code in the 21st century. 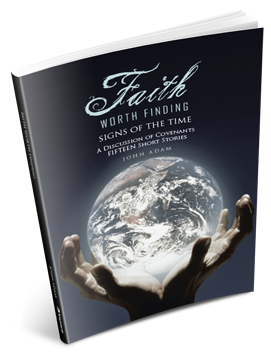 Though the characters and discussions in Faith Worth Finding are fictitious, the conversations will stimulate an interest in the Holy Bible and the references for further reading. This scriptural and scientific presentation is not intended to reflect the view of any religious or scientific organization. This book is a must read for spiritually and scientifically minded seekers of the truth of God’s plan for humankind. Audiobook is ONLY available at Trafford Bookstore.